When I say that effort is required, sometimes a client needs to organise something for a shoot to take place. It could be as simple as clearing out a parking lot, or making a call to a neighbouring firm to organise a time for lights to go on or off. Yet, as soon as effort is required, some clients balk. They want simple solutions that require no effort on their part, but they want the images that would have required some effort. A conundrum of sorts. So I practically jump for joy when I suggest something and the client not only agrees, but then pulls out all the stops to make it happen. 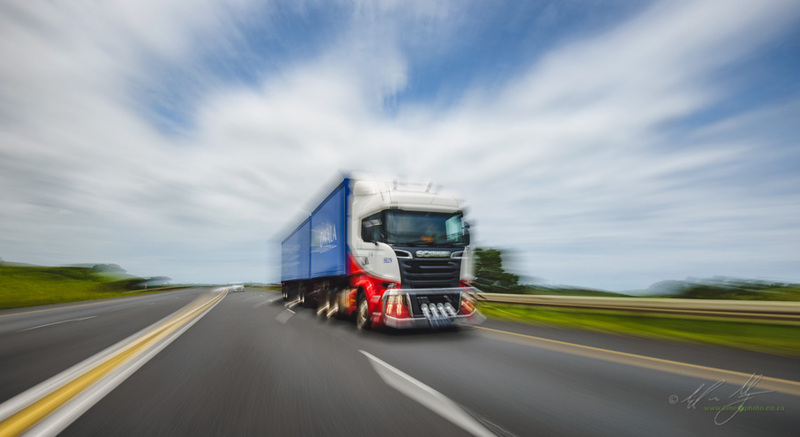 Case in point was a shoot with Pronto Services, a logistics company based in Durban. 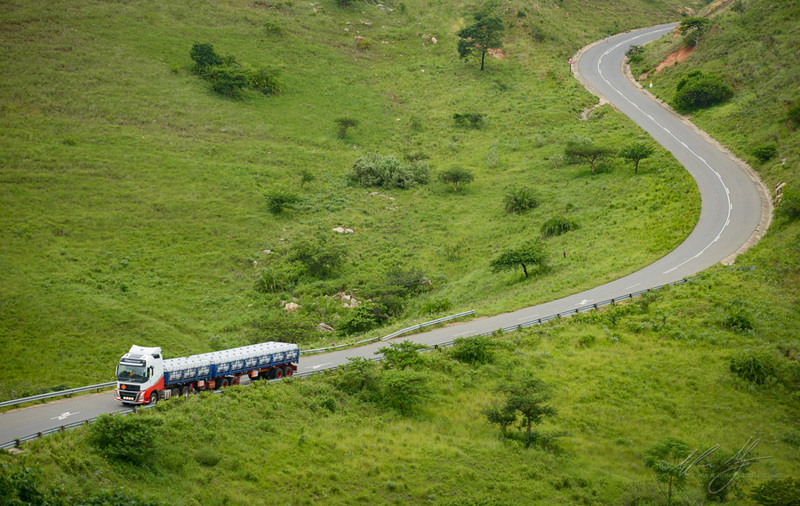 When I met with the owners last year I came up with the idea of shooting a truck on a narrow, but extremely photogenic road in Zululand. The problem for the company was the long drive to get to the road and the odd times that we would have to travel to complete the shoot. They turned around and organised not one, but two 18-wheeler trucks, a pickup truck and accompanied me to the shoot; which had to start at 4am in the morning. 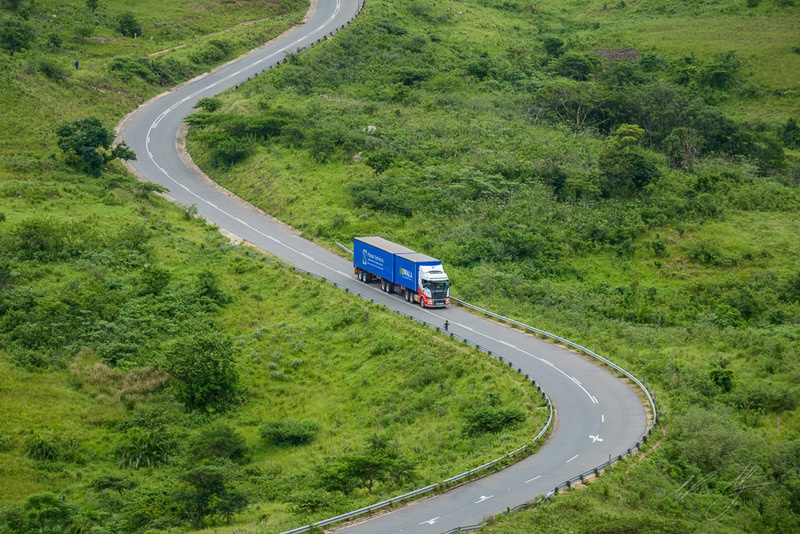 Groggy eyed, we all met up and piled into the double-cab Toyota to make our way to Zululand where we would meet the two trucks with their drivers. Overcast weather meant there wasn’t much in the way of a sunrise, which was a pity. It did give us a larger window to shoot in though which I was appreciative of. After meeting the trucks in a small town, we made our way up and over the pass that I had suggested. The narrow road meant that it was basically impossible to do a retake of an image without travelling the entire length of the pass and then back again. So instead we aimed to try drive the pass to identify the locations I had in mind, then travel back in stages. Each stage would have the Toyota drive ahead, drop the photography crew (Claire and myself) and then double back to the trucks (if necessary). Since there was only one chance at each of the locations, Claire and I would move to different vantage points and create images as the trucks traveled past. In one instance this was particularly invaluable as I used the truck image from her camera and placed it in the wide angle image from my camera as there was an issue with focus with one of my lenses (hooray for Photoshop). The only downside as I discovered were the Zululand ticks that have left me itching insanely for the last week. An occupational hazard apparently. 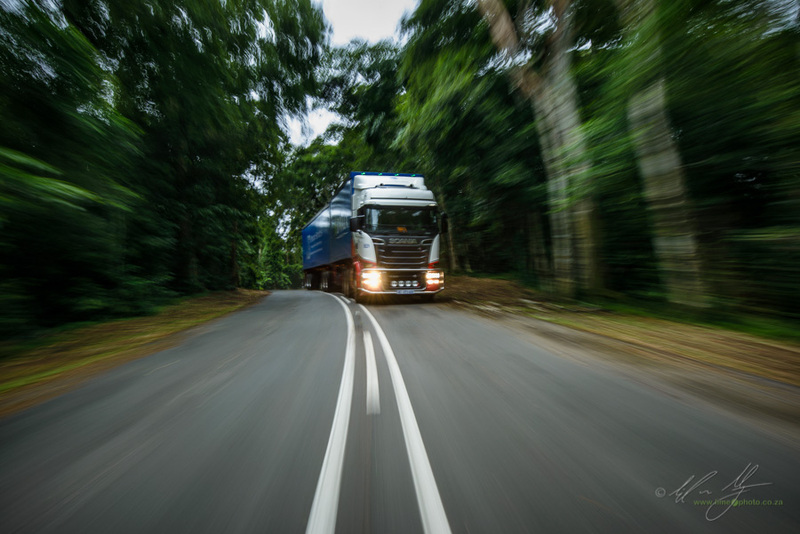 The last image we were to capture were of the trucks moving rapidly through a forest and on the highway so that motion and speed were indicated. To do this I jumped into the back of the Toyota along with Claire. We opened the tailgate and I lay as low to the base of the vehicle as possible. We arranged for the truck to follow at a fairly close distance while attempting to maintain the same speed as the Toyota. 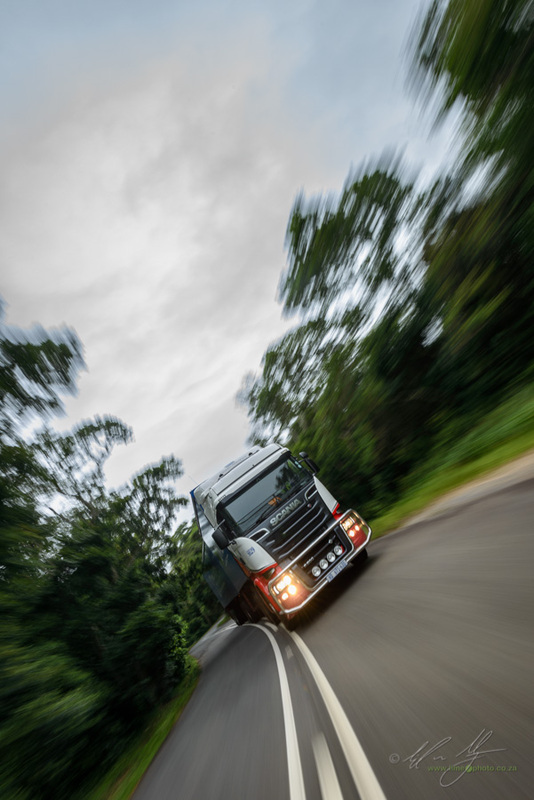 I then dragged the shutter to create images where the movement on the side of the road was obvious, but the truck was sharp and in contrast to the blurred movement on its sides. Vive la digital as we burned through a significant number of frames to get the image right. This is where I absolutely love my 16-35mm Nikkor, as unlike the almost legendary 14-24mm Nikkor, it has vibration reduction which makes the creation of these movement images that much easier. The next step for the job is to create a series of abstract-like images at the client’s warehouse facilities. 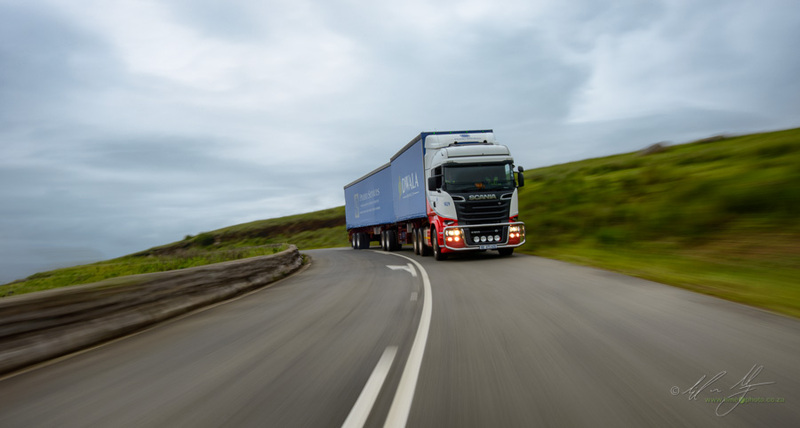 However, the truck shoot was a highlight for me as it was not only challenging, but fun. What I was most appreciative of though, was the fact that my client not only ran with my idea, but went through the effort to make it happen. So often good photographs require more than just the photographer to be involved. This was one such example and it paid off.